Among the most important chemical parameters in a reef aquarium are calcium and alkalinity. Unfortunately, how these relate to each other often perplexes reef aquarists. Such relationships are well understood and described in chemical terms, and I have detailed them using chemical and mathematical equations in many previous articles. These descriptions, however, often are unsatisfying for many aquarists who do not think in such terms. When magnesium and pH are thrown into the discussion, the descriptions of the relationships become even more complex, and are less readily understood by many. "How high can I raise alkalinity before precipitation starts?" "My test kits say the calcium is 700 ppm. That's impossible, right?" Worse yet, such misunderstandings can lead some aquarists to give up trying to understand the chemistry taking place in their aquaria when such simplified ideas lead to conclusions that they know are demonstrably false in their own experience. This article will describe the relationship between calcium, alkalinity, magnesium and pH in simple, intuitive ways. These include very simple pictures that will help aquarists understand the complex processes taking place in ways that, hopefully, make sense and are readily applicable to real world reef aquariums. Further, while these pictures are somewhat simplified, they still are inherently "correct" and so should not lead aquarists down the path to misunderstandings. Calcium is one of the major ions in seawater. Its concentration in natural seawater is about 420 ppm, so it comprises just under 1.2% by weight of seawater's solids. In the ocean, variations from this concentration are most often caused by changes in salinity, which cause the calcium to fluctuate just as the salinity does. A calcium ion carries two positive charges in seawater and is written as Ca++. Calcium is very important in a reef aquarium as many organisms, including corals and coralline algae, take it up in order to deposit calcium carbonate skeletons. If it is not maintained at adequate levels, such organisms become stressed and can even die. I recommend that reef aquarists maintain calcium at 380-450 ppm. Alkalinity is a complex measurement. It is not a "thing" in the water. It is actually the summation of many things, all of which together provide a particular chemical property. The reason that aquarists measure alkalinity is that in normal seawater, most of it consists of bicarbonate and carbonate. Bicarbonate (HCO3-) is what corals take up and process into carbonate (CO3--) in order to build their calcium carbonate skeletons. Consequently, alkalinity is an indication of whether or not adequate bicarbonate is present in the water. Normal to high alkalinity implies adequate bicarbonate, while low alkalinity implies that it may be in short supply. In the absence of any method of supplementing alkalinity in a reef aquarium, the water can rapidly become depleted of bicarbonate. Alkalinity's depletion from normal to unacceptable levels can take only a day or two in some reef aquaria, although it can take longer in aquaria with a lower demand for carbonate. When the water's bicarbonate is depleted, corals that deposit calcium carbonate can become stressed and even die. I recommend that reef aquarists maintain an alkalinity of 2.5-4 meq/L (7-11 dKH, 125-200 ppm calcium carbonate equivalents). Because many corals, coralline algae, and other calcifying organisms require both calcium and alkalinity (as bicarbonate), it is necessary to continually ensure that adequate amounts of these elements are present. Unfortunately, there is a natural tendency toward the abiotic (nonbiological) precipitation of insoluble calcium carbonate from the water as calcium ions and carbonate ions combine. This tendency toward precipitation plays a big role in the relationship between calcium and alkalinity in reef aquaria. Seawater actually contains far more calcium than carbonate or bicarbonate. Even if all the alkalinity in normal seawater was removed by precipitating calcium carbonate, the calcium would drop by only about 50 ppm. For this reason, alkalinity varies much more rapidly and extensively, on a percentage basis, than does calcium when both are over- or under-dosed, relative to their demand. Before discussing the solubility and precipitation of a complicated solid such as calcium carbonate, let's first understand a much simpler case. For example, sodium and chloride ions combine to make solid sodium chloride (table salt). Imagine a small chunk of solid sodium chloride put into freshwater (Figure 1). 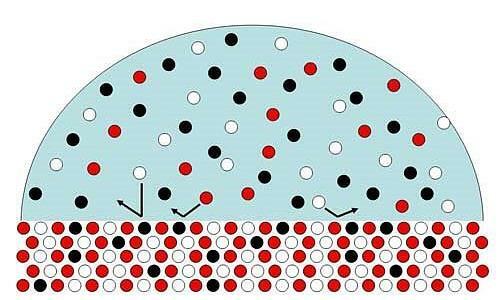 It dissolves as ions leave its surface (Figure 2). Figure 1. A diagram of a simple solid such as sodium chloride in water. 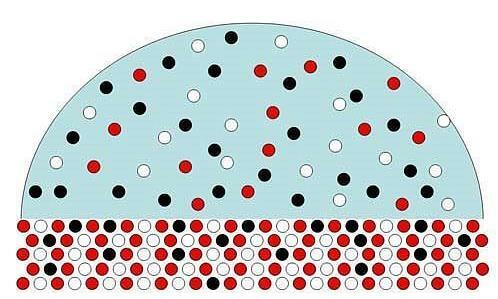 The sodium ions (red) and chloride ions (white) form an ordered structure in the solid. Figure 2. 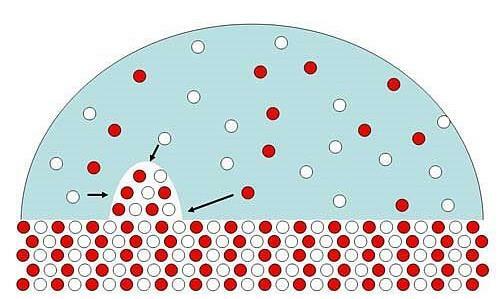 A diagram of what occurs when a simple solid such as sodium chloride (Figure 1) is first allowed to dissolve into water. 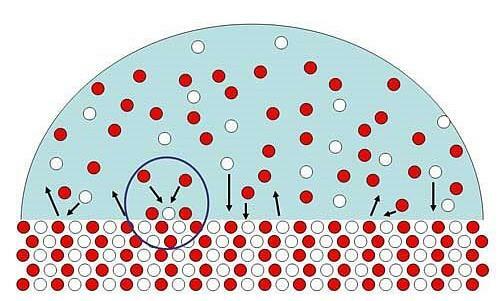 Ions leave the surface and enter the water phase (upward arrows). This process increases the number of ions in the water. Despite the fact that the solid chunk is slowly disappearing, the processes at the molecular level are not one-way. 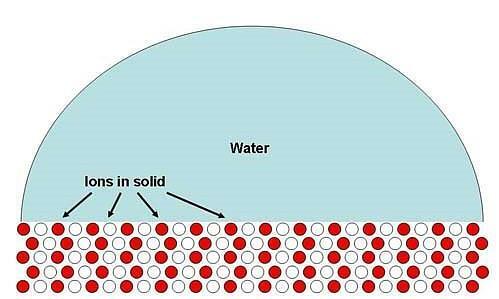 In addition to ions leaving its surface and going into solution, other ions are coming from the solution and landing on the solid surface, thereby becoming part of it (Figure 3). Figure 3. For any solid in solution, there are ions continually landing on and attaching to the surface (downward arrows), in addition to those continuing to be released. Figure 2 shows those that are being released and this figure shows those that are landing on the surface. Eventually, one of two things happens: either all of the solid sodium chloride dissolves, leaving only ions in solution, or the solubility limit is reached, and no more dissolves. What is the solubility limit? Simply put, it is the point where the rate at which ions are landing on the sodium chloride's surface and becoming part of it exactly matches the rate at which ions are leaving it (Figure 4). Because the rate at which ions land on its surface is a function of the number of ions in solution, the solubility limit is a certain concentration of ions in solution at which the "on rate" and the "off rate" are the same. A chunk of salt sitting in saturated sodium chloride solution may look like it is just sitting there, but on a molecular level there is a huge amount of activity, with the flood of ions leaving the surface equaling the flood of ions landing on it. Figure 4. 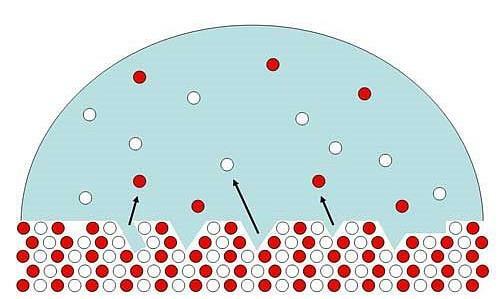 A solid in a solution exactly saturated with its ions has equal numbers of ions landing on the surface (downward arrows) as those that are being released (upward arrows). Over time there may be extensive shuffling of ions between the surface and the water, but the net number of ions in solution doesn't change. In the example described above, the numbers of sodium and chloride ions in the solution are essentially the same, because they all came from the solid sodium chloride, and the solid itself is stable only with equal numbers of sodium and chloride ions remaining in it. But that equality in solution is not always the case. Suppose that we start with a saturated solution of sodium chloride in water. Then we increase the sodium, but not the chloride (we could have increased both, but let's focus on one for now). That might be accomplished by, for example, dissolving some sodium nitrate into the water, which would increase the rate at which sodium ions land on the sodium chloride surface. Such an increase actually makes it more likely that a chloride ion landing on it will also stick. In essence, the sodium ions can quickly bury a chloride ion that becomes briefly attached to the surface, preventing it from "escaping" (Figure 5). In this way, increasing the amount of one ion in the dissolving pair can decrease the concentration of the other, by driving it into its solid phase. Figure 5. When there is an excess of ions in solution, the solution is supersaturated. Here there is excess sodium ions (red) in solution, and as they land and stick to the surface, they also trap chloride ions into the solid (blue circle). As an example, by starting with 10 units of sodium and 10 units of chloride in solution at saturation, and then adding an additional five units of sodium (along with five units of nitrate), the effect will be that the 15 units of sodium and 10 units of chloride become "supersaturated." That is, more is in solution than is stable. The rate at which sodium and chloride land on the surface is greater than the rate at which they dissolve. As time goes by, the amount in solution decreases, and the solution will restabilize (that is, return to saturation) after about 2.2 units of sodium chloride have precipitated, leaving about 12.8 units of sodium and 7.8 units of chloride in solution. While these numbers are factually correct, how they were calculated is somewhat unimportant. All that matters for a simplified understanding is to know that when the water is supersaturated, for whatever reason, some precipitation likely will take place, thereby reducing the amount in solution until saturation is again reached, balancing the ongoing dissolution against the precipitation. Importantly, if the supersaturation is achieved by adding one of the ions in excess, then saturation can again be attained only by reducing the numbers of both ions, because the precipitation onto the surface cannot be restricted to just sodium ions. This effect explains how adding sodium to a saturated sodium chloride solution reduces the amount of chloride present. The solubility of calcium carbonate is similar to the solubility of sodium chloride as discussed above. In particular, the solubility is determined by the "on" and "off" rates of calcium and carbonate ions, and elevating one or the other artificially can help drive the other onto the surface. For example, that effect is why calcium and alkalinity concentrations in seawater are related. 1. Normal seawater (calcium = 420 ppm, pH = 8.2, alkalinity = 2.5 meq/L (7 dKH)) is significantly supersaturated with calcium carbonate. That is, the water already contains more in solution than would be stable in the long term. The rate at which calcium and carbonate ions land on a pure calcium carbonate surface in seawater is higher than the rate at which they leave (magnesium alters this relationship, as detailed in a later section). 2. If the water contains excess calcium and carbonate, then it is possible for precipitation of calcium carbonate to begin, and it can continue until saturation is reached. In other words, if either (or both) calcium or alkalinity are very high in a reef aquarium, then precipitation of calcium carbonate can reduce both. Again, magnesium tends to alter this relationship. This effect can be demonstrated by adding fresh calcium carbonate sand to seawater. A clear drop in pH occurs as calcium carbonate is precipitated onto the fresh surface. It might also be possible to detect drops in calcium and alkalinity, but the process usually stops (due to interference by magnesium) before these parameters drop enough to be detected with a hobby test kit. 3. The more calcium and carbonate ions that there are in excess of "saturation," the faster the rate of calcium carbonate precipitation. In other words, the more the "on rate" exceeds the "off rate," the faster precipitation can take place. 4. If the water is below "saturation" with respect to calcium and carbonate, then no net precipitation will take place. In other words, if either calcium or alkalinity is very low in a reef aquarium, then boosting one or both to natural levels will not immediately reduce the other. The solubility of calcium carbonate depends strongly on pH. The lower the pH, the more soluble the calcium carbonate. The reason for this effect stems from the same sort of analysis we've done all along: "on" and "off" rates of calcium and carbonate ions. In this case, the pH effect is driven by changes in the solution's carbonate concentration. Bicarbonate and carbonate are both forms of the same ion. At lower pH, the bicarbonate form (HCO3-) predominates. At higher pH, more and more of the carbonate form (CO3--) exists (Figure 6). The effect is very strong, in that each 0.3 pH unit drop below about 9 causes a two-fold drop in the carbonate concentration. A full pH unit drop corresponds to a ten-fold decrease in carbonate concentration. Figure 6. A pictorial representation of the relative number of bicarbonate (green) and carbonate (red) ions in solution as a function of pH. As pH is raised, a larger portion of the total ions are present in the carbonate form. The relative numbers in these pictures accurately reflects the ratio of these two ions at different pH values (the alkalinity also rises somewhat between these pictures since a single carbonate ion provides twice the alkalinity of a bicarbonate ion). So as the pH changes, so does the amount of carbonate ion in solution. Because it is the carbonate ions' concentration that drives the "on rate" for carbonate (the rate at which carbonate lands on the surface), then the higher the pH, the faster carbonate is landing on the surface. That means, in turn, that the higher the pH, the lower the solubility of calcium carbonate. Lower solubility implies that calcium carbonate precipitation can be more extensive at higher pH. In other words, as the pH rises, the amount of calcium and alkalinity that can be kept in solution without precipitation decreases. This effect is why, for example, driving the pH very high with limewater can rapidly precipitate calcium carbonate. This is not necessarily because the limewater has added much calcium or alkalinity, although that can play a role, but is also because as the pH rises, much of the existing bicarbonate in the water is converted to carbonate, so the carbonate concentration spikes. Inversely, a falling pH increases the amount of calcium and alkalinity that can be kept in solution without precipitation. This effect is why, for example, driving the pH very low with carbon dioxide can dissolve calcium carbonate in a calcium carbonate/carbon dioxide reactor. At a pH of 6.5, about 50 times less carbonate is present than in the same solution at pH 8.2, so the "on rate" for carbonate ions is greatly reduced. Such a reduction in the "on rate" permits much more net calcium carbonate to dissolve into the water before reaching saturation, where the dissolution process stops. This effect also brings up one of the things that confuse many aquarists. At low pH (say, 7.8), much higher concentrations of calcium and alkalinity can be maintained in solution than at higher pH (say, 8.5). For this reason, aquarists whose aquaria are low in pH often claim that they have no problem maintaining high levels of calcium and alkalinity, and rarely remove calcium carbonate from their pumps, while other aquarists with much higher pH do not understand why they cannot maintain such conditions in their aquarium, or why their pumps often rapidly clog. The effect of having more carbonate at higher pH is one of the main drivers of that difference (the other being that many corals may actually demand more calcium and alkalinity at higher pH, as they can calcify faster at higher pH). As a follow up, do not assume that low pH is better because it allows easier maintenance of calcium and alkalinity, and clogs pumps more slowly. It is also more stressful for many calcifying corals simply because they have a harder time calcifying at lower pH. That increased difficulty is due to the fact that they have to pump out a proton (H+) when they make carbonate from bicarbonate, and the lower the pH, the more H+ already in solution, and the harder it is to pump out the additional H+. Calcium carbonate's solubility also depends strongly on the water's alkalinity. The higher the alkalinity (at a fixed pH), the more carbonate is present (Figure 7). In fact, the amount of carbonate present is directly proportional to the alkalinity. So at an alkalinity of 5 meq/L (14 dKH), there is twice as much carbonate as in natural seawater with an alkalinity of 2.5 meq/L (7 dKH). Figure 7. A pictorial representation of bicarbonate (green) and carbonate (red) ions in solution as a function of alkalinity. As the alkalinity is raised, both bicarbonate and carbonate rise equally. The reason that calcium carbonate solubility changes with alkalinity is the same as in the other analyses in this article: "on" and "off" rates of calcium and carbonate ions. In this case, the alkalinity effect is driven by changes in the solution's carbonate concentration. Lower calcium carbonate solubility at higher alkalinity implies that precipitation of calcium carbonate can be more extensive. In other words, as the alkalinity rises, the amount of calcium that can be kept in solution without precipitation decreases. This effect is why, for example, maintaining a very high alkalinity can lead to excessive precipitation of calcium carbonate onto objects such as heaters and pumps. Likewise, as the alkalinity is reduced, the amount of calcium that can be kept in solution without precipitation is increased. Finally, we come to magnesium's role in the calcium carbonate system. The situation for magnesium is appreciably more complex than for pH and alkalinity, but we can continue our same analysis to understand it qualitatively. When solid calcium carbonate is put into seawater, it doesn't just undergo the sorts of "on" and "off" dynamics as calcium and carbonate ions discussed above. Other ions can get into the crystal structure in place of either of these ions. In seawater, magnesium ions get into calcium carbonate crystals in place of calcium ions. Strontium ions may also do so, but their numbers are far lower than magnesium's (about 600 times lower) so they are less likely to become incorporated. Figures 8 and 9 show how magnesium in solution gets onto and actually into a thin layer of calcium carbonate surface put into seawater. Even though magnesium carbonate itself is soluble enough that it will not precipitate from normal seawater, in a mixed calcium and magnesium carbonate structure, its solubility is lower. So solid, pure calcium carbonate (Figure 8) is rapidly converted to a material with a coating of calcium and magnesium carbonate (Figure 9). Figure 8. A diagram of solid, pure calcium carbonate first put into a solution containing calcium (white), carbonate (red) and magnesium (black). Figure 9. A diagram of solid calcium carbonate in a solution containing calcium (white), carbonate (red) and magnesium (black). Magnesium ions replace calcium ions in the structure, and change it chemically so that it no longer looks like calcium carbonate on the surface. The magnesium penetrates a short distance into the surface, but cannot penetrate the entire structure. This coating has some very important effects. The primary effect is that it makes the surface no longer look like calcium carbonate, so calcium and carbonate ions that land on it no longer find the surface as inviting as before. The magnesium ions have altered the surface in a way that does not hold calcium and carbonate as strongly, and so the "off" rate of any newly landing calcium and carbonate ions is higher (Figure 10). Consequently, even if the driving force to deposit calcium carbonate is still there, the magnesium has gotten in the way and doesn't allow it to happen (or keeps it from happening as fast). Figure 10. Calcium and carbonate ions landing on the magnesium-modified calcium carbonate surface no longer find it as attractive as a pure calcium carbonate surface, and do not remain attached to it. The extent to which magnesium gets onto calcium carbonate surfaces depends strongly on the amount of magnesium in solution. The more there is, the more it gets onto the surfaces. If magnesium is lower than normal, then it may not adequately get onto growing calcium carbonate surfaces, allowing the deposition of calcium carbonate to proceed faster than it otherwise would, potentially leading to increased abiotic precipitation of calcium carbonate from seawater onto objects such as heaters and pumps. Often the inability to maintain adequate calcium and alkalinity despite extensive supplementation, and the precipitation of significant amounts of calcium carbonate on heaters and pumps, are signs that the water has inadequate magnesium. This section summarizes many of the ideas covered in the above sections and puts them together to form a more complete understanding. 1. Normal seawater (calcium = 420 ppm, pH = 8.2, alkalinity = 2.5 meq/L (7 dKH)) is significantly supersaturated with calcium carbonate. That is, more of the ions (several-fold more, actually) are already in solution than would be stable in the long term. The rate at which calcium and carbonate ions land on a pure calcium carbonate surface in seawater is higher than the rate at which they leave that surface. This supersaturation sets up the potential for calcium carbonate precipitation. 2. The potential precipitation described in (1) above is "delayed," sometimes indefinitely, as magnesium gets onto the growing calcium carbonate crystal structure. The magnesium alters the surface, making it no longer look like calcium carbonate. This "poisoning" of the surface slows or stops the precipitation of additional calcium and carbonate onto it. Abnormally low levels of magnesium will be less effective at preventing the precipitation of calcium carbonate. 3. The more calcium and carbonate there is in excess of "saturation," the faster the potential rate of calcium carbonate's precipitation. In other words, the more the "on rate" exceeds the "off rate," the faster precipitation can take place. If the potential for rapid precipitation exists due to a very high supersaturation condition, the more likely such precipitation is to overwhelm magnesium's ability to prevent it. 4. The factors that lead to higher supersaturation are higher calcium, alkalinity and pH. The effect of pH is especially dramatic, with an increase of 0.3 pH units being equivalent to a doubling of calcium or alkalinity in terms of the supersaturation (or in terms of the driving force for precipitation). This pH effect is why an overdose of limewater can cause calcium carbonate precipitation, and why dosing limewater into a skimmer or other enclosed system (such as a pump intake) can increase precipitation of calcium carbonate inside it. It is also why reducing the water's pH in a calcium carbonate/carbon dioxide reactor can dissolve calcium carbonate media. 5. If the water is below "saturation" with respect to calcium and carbonate, then no net precipitation will take place. Under normal seawater conditions, where the water is, in fact, supersaturated with calcium carbonate, there is still little precipitation, largely because of the magnesium in the seawater. Consequently, if calcium or alkalinity is lower than "normal" in a reef aquarium, then boosting either (or both) calcium and alkalinity to natural levels will cause no rapid precipitation of calcium carbonate. In other words, boosting one under these conditions will not cause a rapid decline in the other. 6. When calcium carbonate precipitates, it uses up a fixed ratio of calcium and carbonate (1:1, or about 20 ppm of calcium for each 1 meq/L (2.8 dKH) of alkalinity). This ratio is the same as corals use to deposit their calcium carbonate skeletons. Abiotic precipitation of calcium carbonate, like coral skeletal formation, can incorporate other ions, such as magnesium and strontium. That incorporation will reduce the above ratio from 20 ppm calcium for each 1 meq/L of alkalinity to a slightly lower value. Over the long term this process can deplete magnesium and strontium in an aquarium if only calcium and alkalinity are supplemented. 1. Corals and coralline algae use calcium and alkalinity almost exclusively to deposit calcium carbonate. Because of this they use a fixed ratio of calcium to alkalinity, which is driven by the ratio of calcium and carbonate in calcium carbonate (1:1). The net consumption is about 18-20 ppm of calcium for each 1 meq/L (2.8 dKH) of alkalinity. The reason the amount of calcium varies is that the incorporation of magnesium in place of calcium varies a bit from species to species. 2. The fact that corals and coralline algae use a fixed ratio of calcium to alkalinity allows supplements to be devised that mirror this exact ratio. Using such an additive system allows accurate matching of the supplement to the demand, and does not cause rapid swings in calcium or alkalinity relative to each other if the additions are not perfect. Such balanced additives include calcium carbonate/carbon dioxide reactors, limewater/kalkwasser and two-part supplements, among others. 3. Under natural seawater conditions (calcium = 420 ppm, pH = 8.2, alkalinity = 2.5 meq/L (7 dKH)), many corals and coralline algae are thought to be limited in their calcification rate by the water's alkalinity level. If the water has additional bicarbonate (alkalinity) in it, then it is possible for deposition of calcium carbonate to occur more rapidly. In other words, if alkalinity is increased in a reef aquarium, then the deposition of calcium carbonate can reduce both calcium and alkalinity. 4. If the water's calcium level is below a certain threshold (about 360 ppm when alkalinity is normal), then it can limit calcium carbonate skeletal deposition by corals. In this situation, boosting calcium to natural levels or higher will reduce the alkalinity over time as corals begin to use the calcium and alkalinity at a faster rate. 5. If the concentration of calcium or carbonate is too low in a reef aquarium, then corals will have a harder time depositing their calcium carbonate skeletons. Such conditions can stress or even kill them. Under extreme conditions, their skeletons can even dissolve. Aquarists often overlook pH as a big driver in reducing carbonate concentration. Even if the calcium and alkalinity match normal seawater concentrations, pH values below about 7.7 can permit aragonite skeletons to slowly dissolve because the amount of carbonate in solution is so low. The Relationship Between Alkalinity and pH. When Do Calcium and Alkalinity Demand not Exactly Balance? 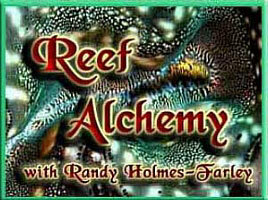 Calcium and alkalinity are closely related in reef aquaria. This relationship is caused primarily by the way that they combine to form calcium carbonate. The deposition of calcium carbonate can take place as organisms form skeletons, shells and other structures, and as it is abiotically precipitated onto objects such as heaters and pumps. The formation of calcium carbonate by any mechanism uses an approximately fixed ratio of calcium and alkalinity, allowing aquarists to devise strategies that supplement these together in this same ratio. One way that aquarists can think about the relationships between calcium, alkalinity, pH and magnesium is by how they impact the way that calcium and carbonate in solution come together to precipitate as calcium carbonate. Elevating calcium or carbonate will increase the likelihood of calcium carbonate precipitation. 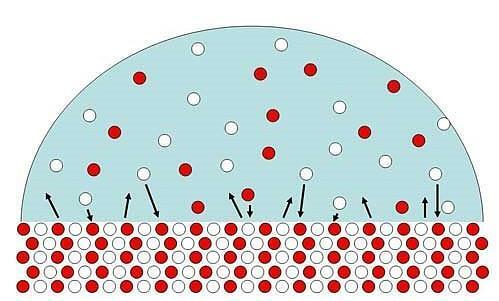 This happens as the ions land on, and become attached to, the growing calcium carbonate surface faster than other ions leave it. Such elevations can come from obvious sources, such as increasing calcium or alkalinity, or through less apparent sources, such as increasing pH. Additionally, magnesium impacts how effectively calcium and carbonate that are "trying" to precipitate are able to do so. It does this by altering the growing calcium carbonate solid so that it no longer looks as inviting for additional calcium and carbonate ions to stick to it. Understanding these mechanisms can help aquarists to understand and act on the many real world situations that they must address appropriately. These include maintaining calcium and alkalinity, keeping pumps from clogging, reducing the likelihood of sand beds becoming cemented together, avoiding massive calcium carbonate precipitation events and keeping corals and other calcifying organisms thriving.